Twelve-year-old Haftu Strintzos has come from the other side of the world to impress kids, families and politicians alike with his speed and dedication on the running field. Haftu was born in Tigray, a rural area of Ethiopia afflicted by famine and a centre of conflict since the 1980s. After losing both his parents at a young age he was adopted by volunteer worker Maria Strintzos in 2010 and they moved to Melbourne last year, where Haftu attends Oakleigh South Primary School. He’s been running since he was a young child; “When I was small I used to run everywhere” he says, but it wasn’t until he arrived in Australia that he started running competitively. 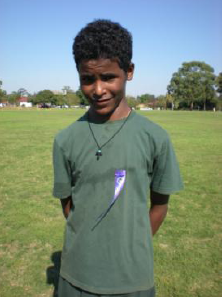 After starting school he told Maria, “I want to run!” Coming from Ethiopia, it seems it was in his blood. Maria says, “It’s in Ethiopian DNA to be long-distance runners.” Some of the most famous Ethiopian Olympic runners even come from Haftu’s district. A lot to live up to? “Most of the Ethiopian people like running” Haftu agrees. He is both modest and realistic about his running skills. “I can go fast,” he says, but acknowledges that there are many kids in his team to give him good competition. But he’s up for the task; “I’ve been practicing,” he says. With the scholarship money from SWB Maria paid for registration costs, track and field shoes (‘spikes’) and durable running shoes for Haftu. Not only did this help financially but also in a bigger way; “For Haftu it’s a way of acknowledging him. It’s a way of him seeing that people and organisations are prepared to invest in him.” This symbol is important to instil a sense of pride in his running, his culture and himself. Haftu dreams of competing in the Olympics (“if I’m fast enough”). This may seem like a big goal for a small boy but it stems from the humblest of wants. “I want to make people proud,” he says. He’s well on the way.